Bexhill United Football Club brought up a century of goals in all competitions this season in superb style on Saturday. 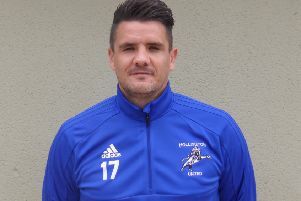 The Pirates pulled off an emphatic 6-0 victory away to Wick in Southern Combination League Division One - the seventh time they’ve scored six or more goals in a game this season. Bexhill manager Ryan Light said: “It’s a fantastic achievement really. Our biggest problems in the last two years have been scoring enough goals and consistency, and we’re really pleased we’ve finally got that. With leaders Alfold drawing and second-placed Steyning Town losing, third-placed Bexhill are now only three points from the top. Bexhill almost scored in the first 30 seconds. Drew Greenall latched on to a ball which was slipped past the Wick defence and smashed a left-footed shot against the post. The visitors were so tenacious in midfield, winning the ball back quickly seemingly whenever the opposition had it, and forcing the Wick goalkeeper to pull off some good saves. Bexhill broke through in the 21st minute. Jack Shonk, who had an excellent game, got past his man and made his way to the byeline before putting the ball on a plate for Greenall to score at the near post. One became two in the 39th minute. After Jamie Bunn charged into the box and lifted the ball over an opponent as it bounced up, Sammy Bunn arrived and struck a lovely shot on the stretch into the roof of the net. Bexhill went three-up on the stroke of half time with what Light described as his favourite goal of the season. Kyle Holden started a flowing move from Bexhill’s own byeline and a few passes later it ended with Shonk delivering a sublime cross for Greenall to strike an unbelievable volley which hit the underside of the crossbar, came down and bounced up into the roof of the net. Bexhill made it 4-0 less than three minutes into the second half. Shonk pulled the ball back from the left to Sammy Bunn, who had quite a lot to do in a crowded area but struck a lovely shot right into the top corner. By this stage Bexhill were mounting attack after attack. Sammy Bunn had a couple of chances to add to his tally and Greenall rolled a shot into the goalkeeper’s arms when well placed. Goal number five arrived in the 72nd minute. After a good passage of play, Jamie Bunn found himself in the box and worked half a yard of space before firing a rocket of a shot past the goalkeeper. The 100th goal of the campaign came seven minutes later. Shonk burst past the last defender on the Bexhill right before unleashing a powerful shot which flew past the goalkeeper at his near post. Bexhill: Rose; Holden, McFarlane, McGuigan, Ottley (Robertson); J. Bunn, Foster, S. Bunn; Parchmont (Kalambayi), Greenall (Ham), Shonk.